A doting father with a crime-riddled past whose claims on him are not yet expired (and whose failures are recorded on nearly every inch of his body). A devoted daughter who tends to act (or react) first and ask questions later. A soured, irascible in-law/grandmother with an indomitable protective instinct. A closetful—one might say a houseful—of guns of every caliber and description. A quiet coastal fishing community with buried secrets simmering underneath the sand. What could possibly go wrong? 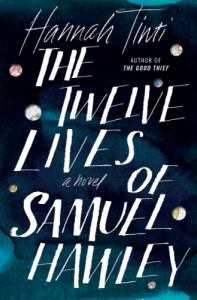 Excursions, explosions, and eruptions abound in Hannah Tinti‘s wonderfully picaresque novel (The Twelve Lives of Samuel Hawley), a book whose pages all but turn themselves. Though it’s a thriller to the last leaf, it’s also a story about love and indifference, loyalty and loss, friendship and the ineradicable demands of one’s own past. Besides enjoying this extraordinary family drama, you’ll be fascinated, as I was, to learn myriad details about clamming and fishing, sailing (including plotting your course by the stars), the age, range, and caliber of multiple firearms, and grand larceny on a spectacularly competitive scale. And did I mention the book is plotted along the grid of classical mythology? Why, it’s as if Heracles woke up in bed with Elmore Leonard. Enjoy the ride! This entry was posted in Book Reviews, On Books and tagged #books, adventure, fiction, greatread, Hannah Tinti, novel, review. Bookmark the permalink.